Dala Glass Glaze is a water-based paint, available in 15 colours. It produces a beautiful durable, high gloss, glasslike finish, without any streaking. This product is particularly popular with paper maché and glass artists. Use the pen to trace the design onto the paper side of the self-adhesive plastic. The design must be visible on the plastic side. Use the Dala Glass Liner to trace the design onto the plastic side. Allow to dry for 2 – 3 hours. Tip: For an effective, evenly-lined design, ensure that the liner bottle is held at a 45° angle, so that the hole of the nozzle is always visible, thereby creating a raised and not a flat line. 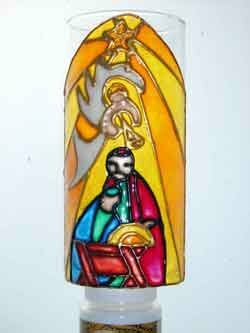 Use the Dala Glass Glaze to colour the design, working between the Glass Liner lines. Start colouring right next to the liner and work towards the inside. Tip: The Glass Glaze bottle should never be shaken – this will only aerate the paint. Only stir the paint gently when necessary. To ensure a perfectly smooth finish, the Glass Glaze must be used on an absolutely level surface. Dala Glass Glaze Clear can be used to achieve even more see-through shades on the wings – just mix with the colour until the desired shade is achieved. Use your scissors to cut out the design. Gently pull off the paper layer and stick onto the container. Place candle into container and light it. The light from the candle will light the design beautifully from the back, creating a very special atmosphere. This item has 710 views.